The aim of the present paper is to prove a formula based on the reduction in scattered beam due to inverse square law at a point on the central axis of beam, based on which one can extract equivalent square field of a rectangular field. Considering a rectangular field with dimensions of a × b, absorbed dose at point A is due to primary and scattered beams. 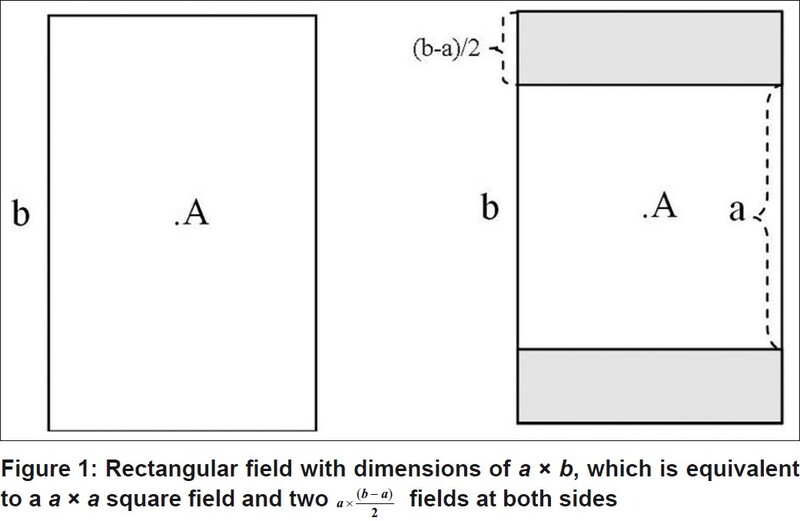 So, one can consider that absorbed dose at point A is caused by square field with dimensions of a × a and two strips at the corners with dimensions of exist at both side of center [Figure 1]. 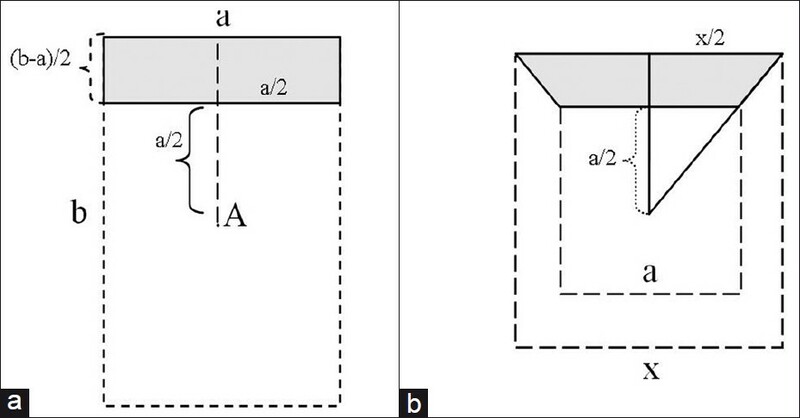 where S is scattered beam, x 2 - a 2 is stripped peripheral surface in [Figure 2], and a(b - a) is total stripped surface in [Figure 1]. Although the above answer seems to be complicated, since all variables in Equation (3) are numerical, the answer is easily obtained by computer for each desired value of a and b. 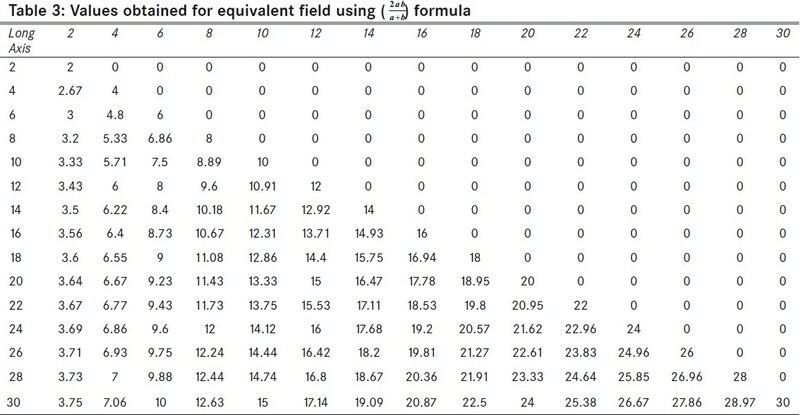 A comparison of published tables by ICRU [Table 1] with tables obtained from Equation (7) [Table 2] and from [Table 3]  shows that in large fields, which are usually used in radiotherapy, calculated values in [Table 1] are very close to the values in [Table 2]. For instance, if we consider a 20 × 10 field, a value of 13 is obtained from [Table 1] and values of 13.1 and 13.3 are obtained from [Table 2] and [Table 3], respectively. The power of the proposed method with respect to the previous methods is its possibility to calculate the equivalent field for shielded fields. 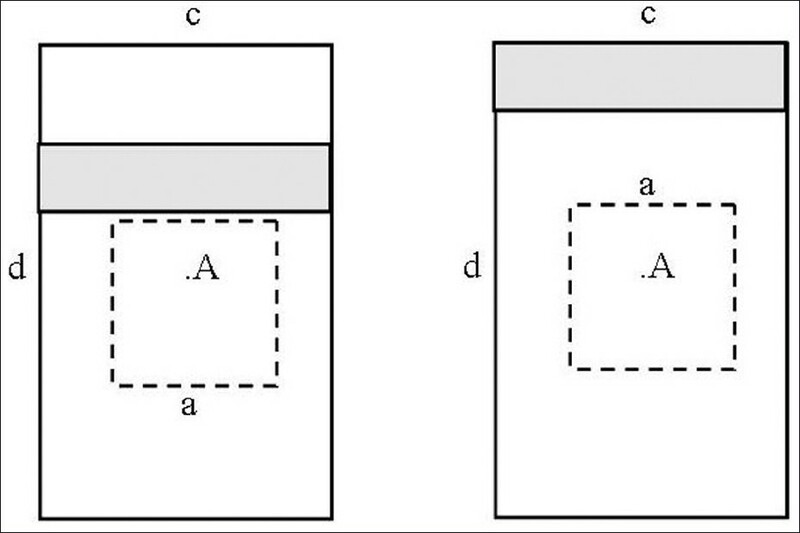 Most computational methods and formulas used in treatment planning for determination of equivalent square field and dose calculation provide a fixed equivalent field for a shielded field without considering the shield position in the field; this is while the scattered beams reaching point A depend on shield position and consequently the equivalent fields must be different [Figure 4]. As it is obvious from this figure, although the shield position and so the scatter is different, the equivalent square field for both conditions is the same. This will be important when working with fields and shields of large dimensions. However, this will be easily achieved by the proposed method for obtaining Equation (7) by separating a central square field to calculate equivalent field and scattered beams considering inverse square law. Besides, in multi-leaf collimators [Figure 5], if the dimensions of each leaf are known, this technique may be easily used to calculate the dose and equivalent square field (Equation (8)). 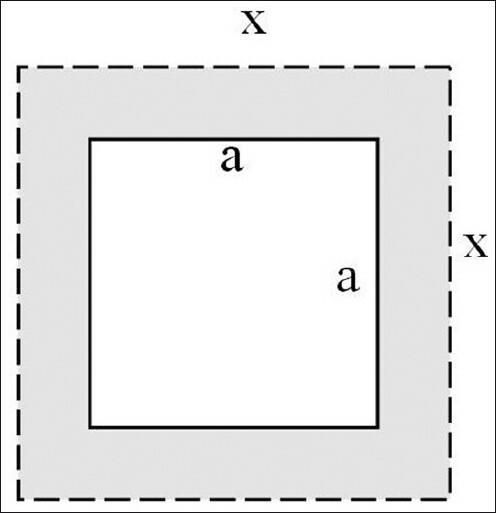 Where a i and b i are dimensions of area outside the a × a square, which totally results in the desired field shape, this is a potential capability which needs more detailed work to be practically useful. The importance of the proposed method is that it enables one to calculate dose at an arbitrary off-axis point provided this point does not place on the sides of the rectangular field. It is possible to consider the effects of beam quality by calculation of attenuation in phantom and inserting the e -μr factor in Equations (2 and 4); considering the dependence of attenuation coefficient on energy and atomic number, the proposed formula might become more appropriate with results much closer to real conditions, which needs a brief simulation and phantom measurement. The presented method is an analytical approach based on which one can estimate the equivalent square field of a rectangular field and may be used for a shielded field or an off-axis point. Besides, one can calculate equivalent field of rectangular field with the concept of decreased scatter radiation with inverse square law with a good approximation. This method may be useful in computing PDD and TPR which are extensively used in treatment planning. 1. Depth dose tables for use in radiotherapy. A survey, prepared by the Scientific Sub-Committee of the Hospital Physicist's Association, of central axis depth-dose data measured in water or equivalent media. Br J Radiol 1978;10 Suppl 11:1-96. 2. McCurdy BM, Pistorius S. Determination of equivalent photon fields through integrated 1D convolution kernels. Phys Med Biol 1999;44:2971-85. 3. Pirotta M, Aquilina D, Bhikha T, Georg D. Comparison of the ESTRO Formalism for monitor unit calculation with a Clarkson based algorithm of a treatment planning system and a traditional "full-scatter" methodology. Zeitschrift fur Medizinische Physik 2005;15:235-46. 4. Venselaar JL, Heukelom S, Jager HN, Mijnheer BJ, van Gasteren JJ, van Kleffens HJ,et al. Is there a need for a revised table of equivalent square fields for the determination of phantom scatter correction factors? Phys Med Biol 1997;42:2369-81. 5. Xiao Y, Bjärngard BE, Reiff J. Equivalent fields and scatter integration for photon fields. Phys Med Biol 1999;44:1053-65. 6. Lombardi P, Fiorino C, Cattaneo GM, Calandrino R. Monitor unit calculation in 6 MV irregularly shaped beams - Accuracy in clinical practice. Br J Radiol 1997;70:638-44. 7. Storchi P, Woudstra E. Calculation of the absorbed dose distribution due to irregularly shaped photon beams using pencil beam kernels derived from basic beam data. Phys Med Biol 1996;41:637-56. 8. Stern RL, Heaton R, Fraser MW, Goddu SM, Kirby TH, Lam KL . Verification of monitor unit calculations for non-IMRT clinical radiotherapy: Report of AAPM Task Group 114. Med Phys 2011;38:504-30. 9. Storchi P, Woudstra E. Calculation models for determining the absorbed dose in water phantoms in off-axis planes of rectangular fields of open and wedged photon beams. Phys Med Biol 1995;40:511-27. 10. Tudor GS, Thomas SJ. Equivalent diameters of elliptical fields. Br J Radiol 2004;77:941-3. 11. Khan FM. The physics of radiation therapy. Philadelphia, PA: Lippincott Williams and Wilkins; 2010. 12. Thomas SJ, Eaton DJ, Tudor GS, Twyman NI. Equivalent squares for small field dosimetry. Br J Radiol 2008;81:897-901.